Difficulty Notes: Named in 1998. 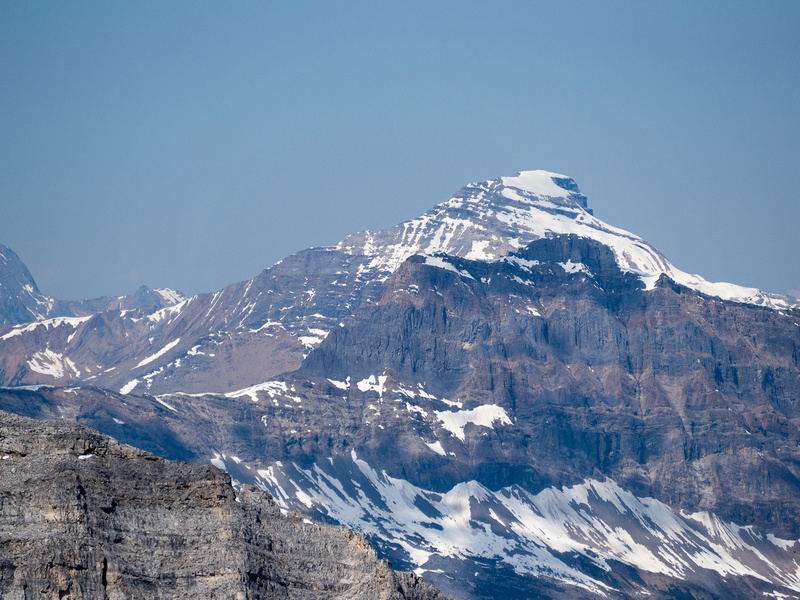 The mountain is situated on the Continental Divide. Official name. (from peakfinder.com) NOTE: The height listed as 9400 feet is much too high for this peak which is closer to 7900 feet high. On Friday, July 7 2017 I finally managed to get out with a couple of Facebook friends that I had never actually met in person. I met Liz and Mike at the gate blocking the old highway 1A near the Lake O’Hara parking lot for an attempt at one of the newest Alan Kane scrambles, rated difficult. Kane mentions Divide Mountain in an interview with Gillean Daffern as one of his new favorites. 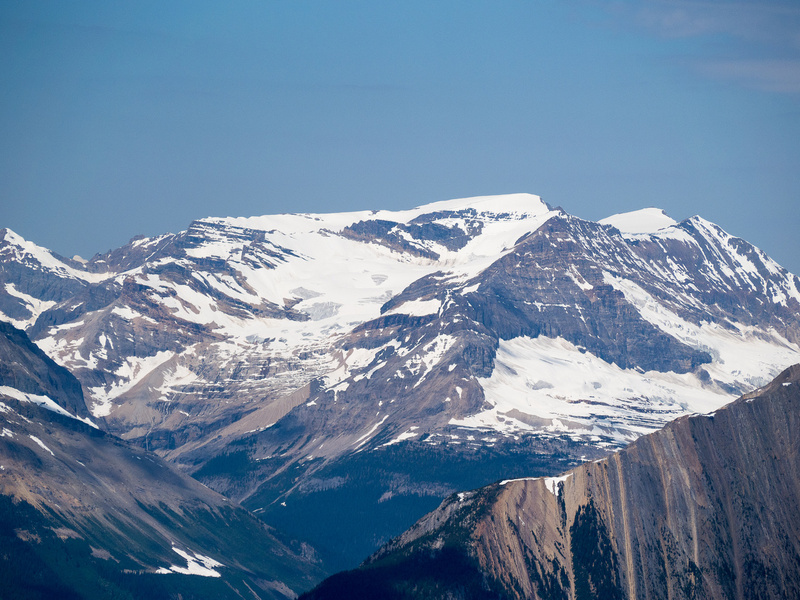 This personal recommendation from Kane, and the limited, encouraging beta slowly coming out on this diminutive peak that sits on the border of Banff and Yoho National Parks elevated it on our respective summit lists. One huge bonus of going out with new friends is that there’s a lot to talk about. 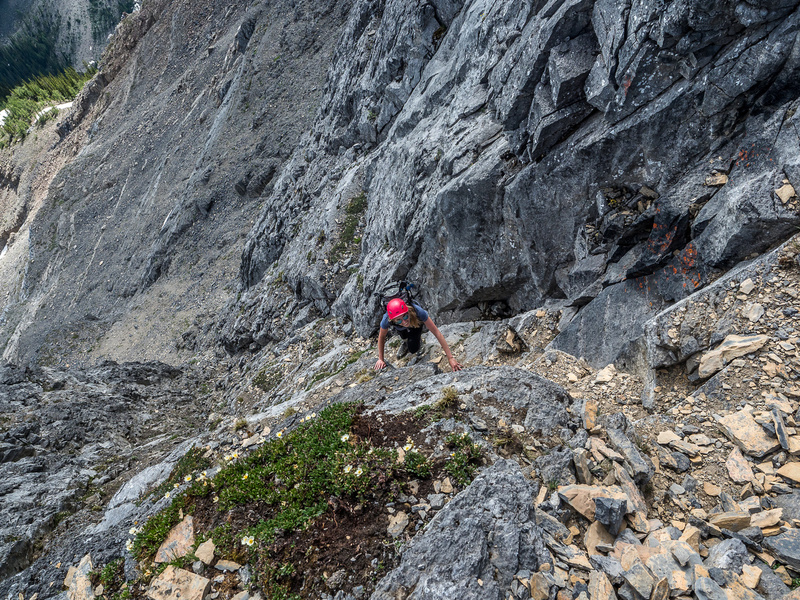 Despite horrific numbers of mosquitoes on the approach road and trail to Ross Lake, the time flew by and soon Mike was leading the way through the bushwhack to the avy slope / gully under the face of the mountain. The bushwhack was mercifully short and quite easy and before we knew it, we were in the rocky gully / stream bed at the center of the avalanche slope leading to the north face of Divide. As we approached the face, I kept looking hard at the scramble route, which was getting more and more obvious the closer to the mountain we got, but not looking much easier! 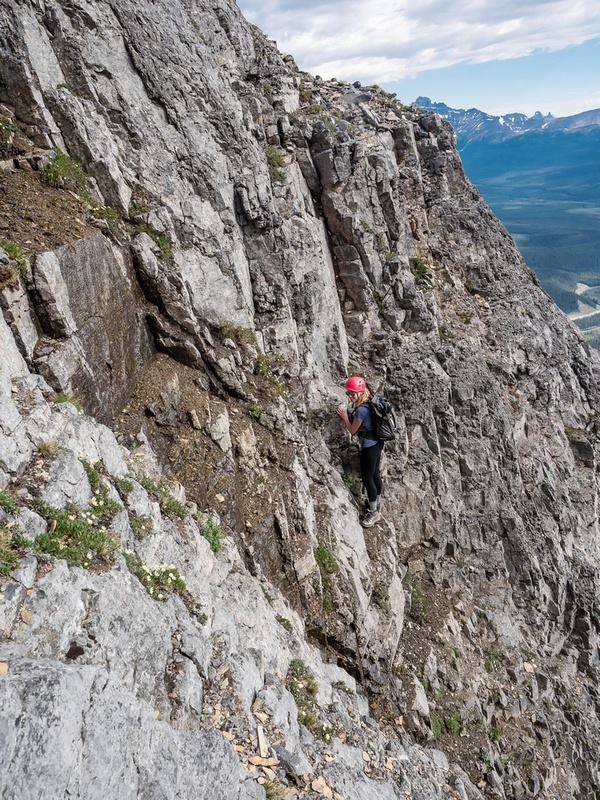 Liz led up the lower part of the approach on relatively easy terrain until we found ourselves fairly high on the NE shoulder with great views of both the north face and back over Yoho and the Bow Valley. The terrain here was pretty loose – the so-called “Kane Effect” certainly hasn’t happened on this peak just yet. We took a short break (Liz and Mike don’t set a slow pace) before donning helmets and starting up towards the crux. Easy scrambling to the shoulder of Divide Mountain from Ross Lake. From our vantage on the NE shoulder, we could start to clearly pick out a moderate approach to the crux chimney / ledges. 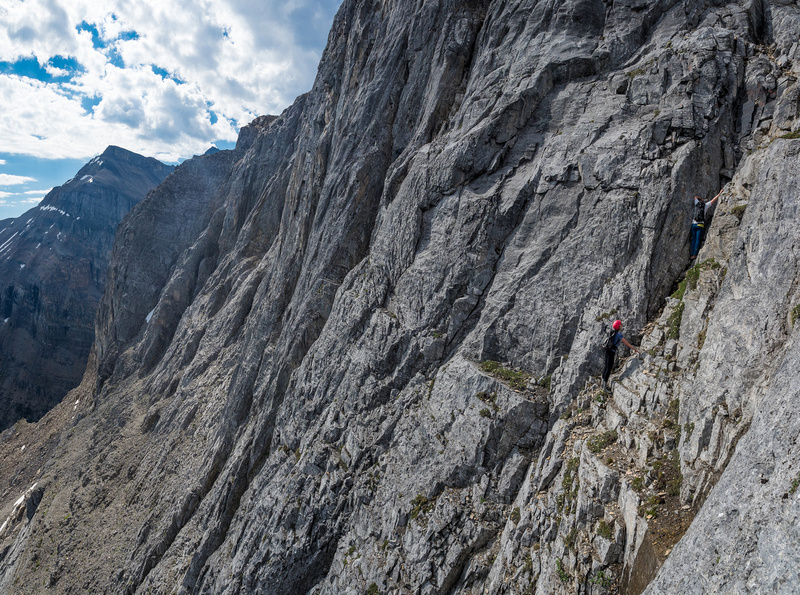 As so often happens in the mountains, the scramble route slowly became more and more reasonable as our noses got closer and closer to it. 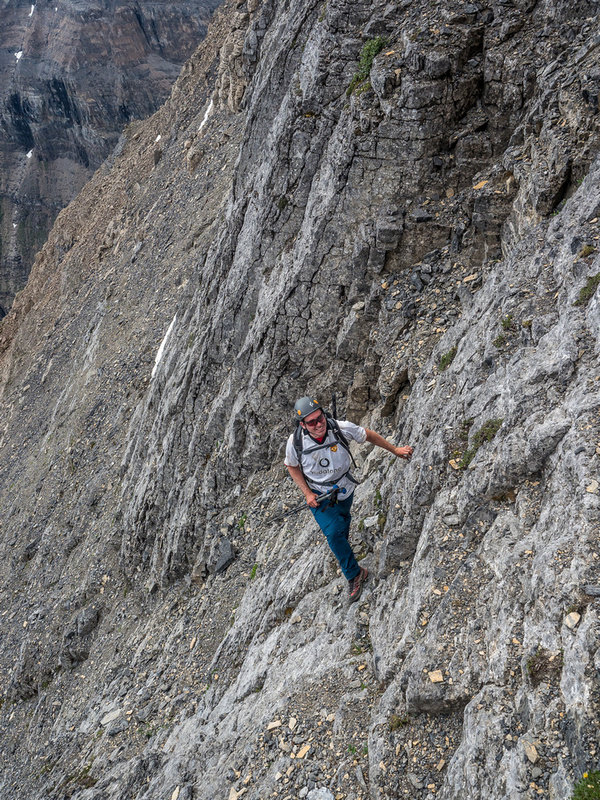 A slabby traverse led to a shallow, slabby gully which rose diagonally towards a steep chimney / ledge system that led up towards the summit slopes. There was a large patch of snow waiting atop the crux which we were hoping wouldn’t cause us issues. 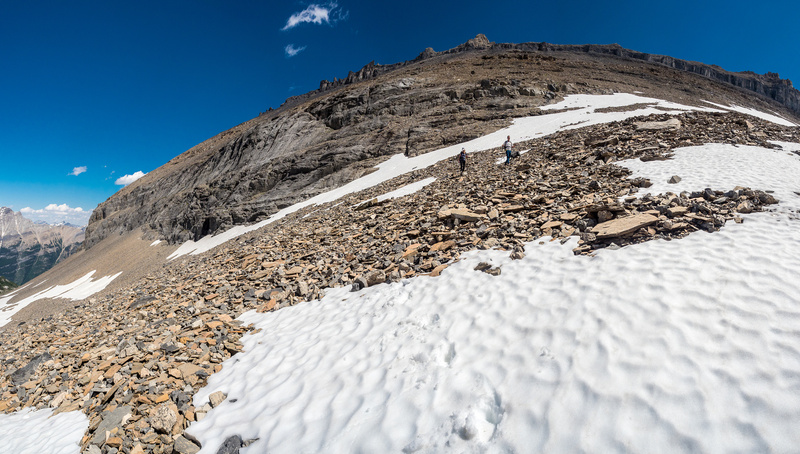 We had our axes along, but no crampons, and I was in my light scrambling shoes and had no desire to deal with exposed snow slopes on this hot summer day. Liz led the way up towards the bottom of the crux and Mike and I followed her carefully. The terrain here is loose and I highly recommend choosing experienced partners for this mountain due to the rockfall hazards on it. Thankfully we were all cautious and managed to get to the bottom of the crux unscathed. Looking up the crux, we could see some encouraging weaknesses and didn’t waste much time thinking about it, before heading up. 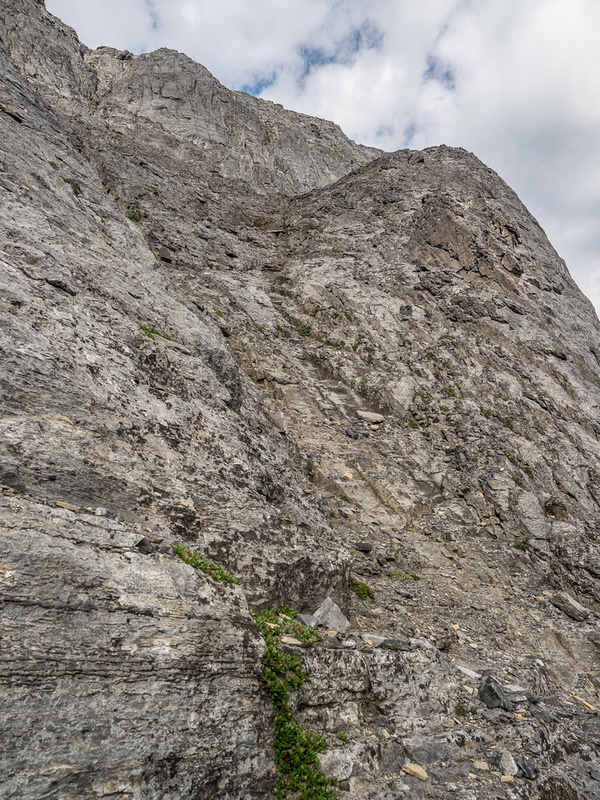 There are two routes up the crux and both are exposed and difficult. Both look easier from the other. 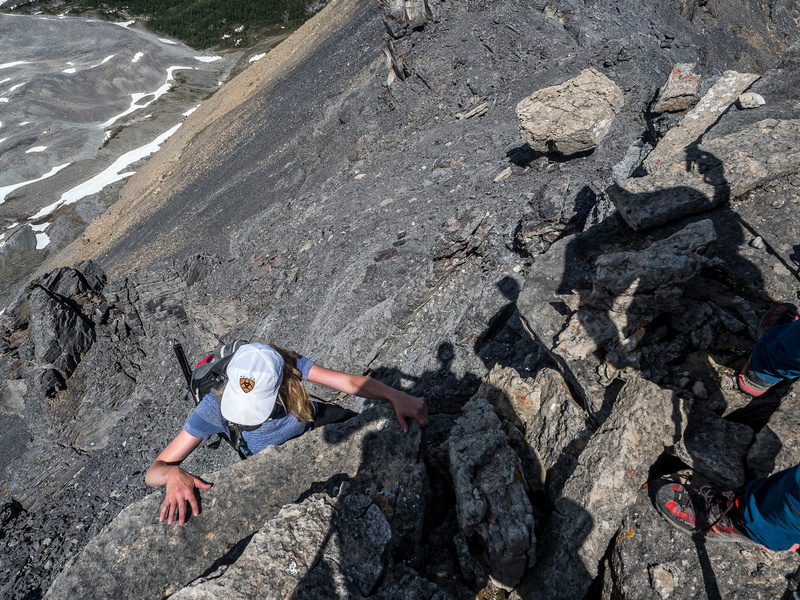 😉 Liz and Mike went up the chimney directly before traversing out of it and ascending to the summit ridge while I traversed climber’s right over a few very exposed and questionably loose footholds before heading up on a steep series of ledges. There was one awkward step to overcome while transitioning out of the chimney but fairly good holds otherwise. Soon after starting up the crux section, we were all standing under a giant snow bank hoping we could somehow get around to the easy summit slopes. Some of the reports I’ve been reading on scrambles lately, seem to be downplaying their difficulties a bit. I understand why, but this can be dangerous when posting public beta. I love Kane’s ratings because in general if you feel like you’re climbing, rather than scrambling, you’re probably off route. Divide Mountain is no different. 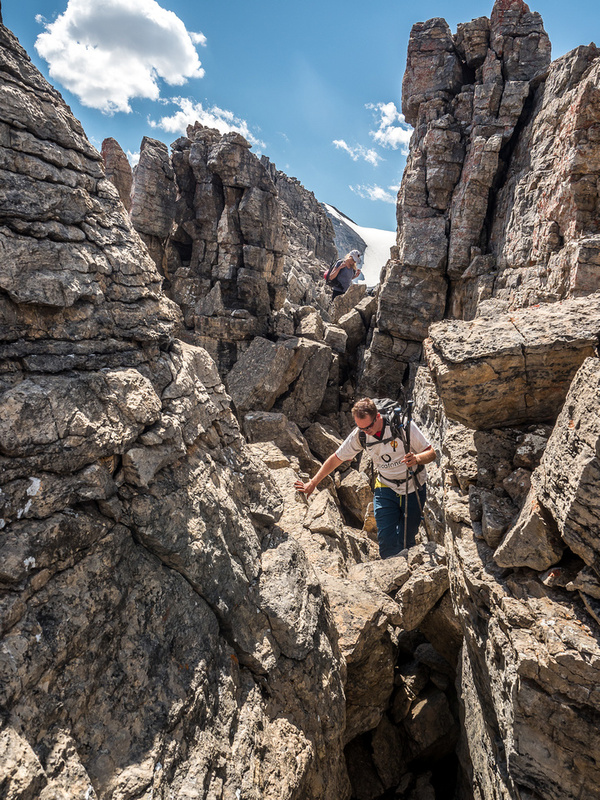 The crux is definitely difficult scrambling – you fall and you’ll likely die – but it’s not more than scrambling if you’re on route, and it’s quite a short section. Thank you Alan, for keeping consistent in your ratings in the new book! We ascended the shallow, slabby feature just above Liz’s head to the left. Looking down as Liz crosses to the easier climber’s left access to the base of the crux. 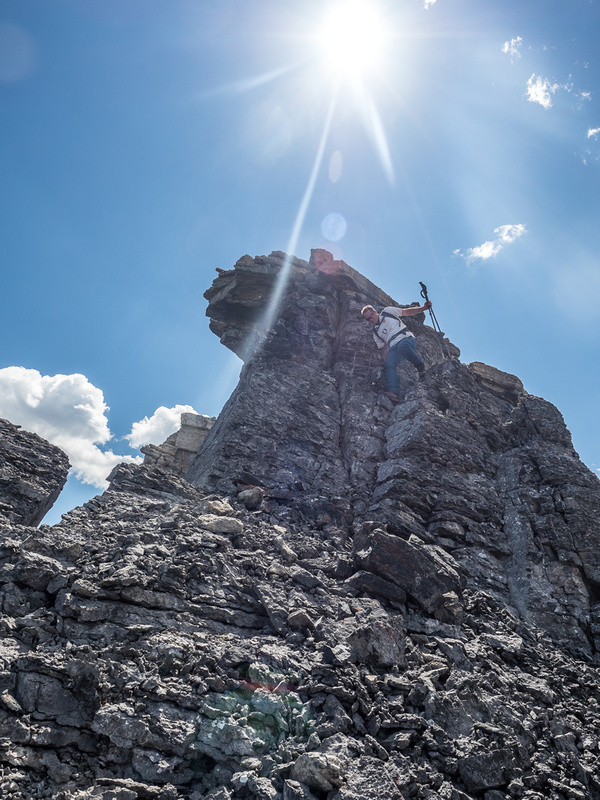 Mike navigates the crux on Divide Mountain. A great shot of Mike and Liz in the crux chimney on Divide. We had a short second crux to deal with due to the snow bank blocking our access from the top of the face to the summit ridge. This crux was a short slab which was wet (potentially slick) and very exposed to the north cliff face. Thankfully we just managed to squeeze by this section and found ourselves looking up at the very relaxed scree slope to the top. Before long we were standing at the giant cairn – 2.5 hours after leaving the parking lot. 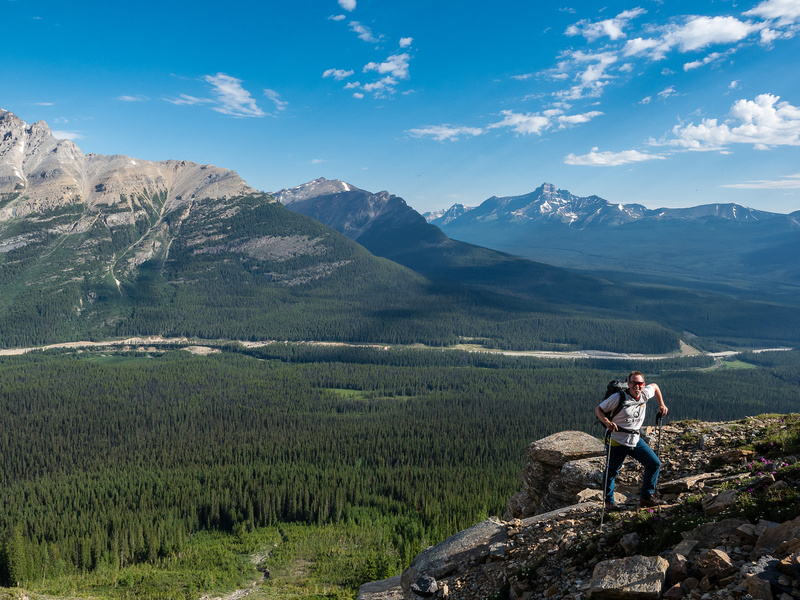 Needless to say – Divide Mountain doesn’t have to be a very long day! After enjoying the views from the summit, we packed up again and headed south along the ridge for the high point which wasn’t visible yet. IMHO it doesn’t make much sense to scramble Divide without going for the high point, considering the views and the fun scrambling along the ridge towards it. 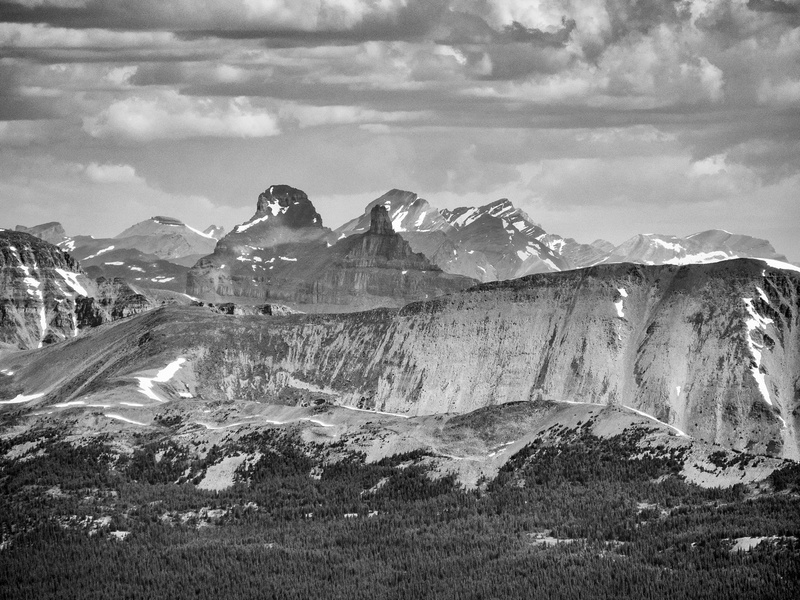 The views into the valleys on both the east and west sides of Divide Mountain were stunning. Niblock and Whyte stole the show to the east, Pope’s Peak to the south and Narao to the west. Bosworth and Mount Hector were the two obvious summits stealing the show behind us, to the north. 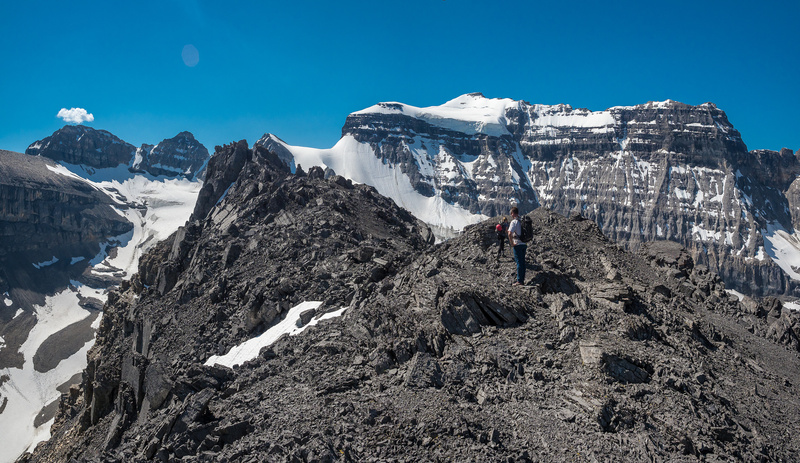 We were expecting nothing more than an easy scree walk along the ridge to the high point and were pleasantly surprised with a few moderate sections of scrambling instead. One move in particular was close to being difficult. 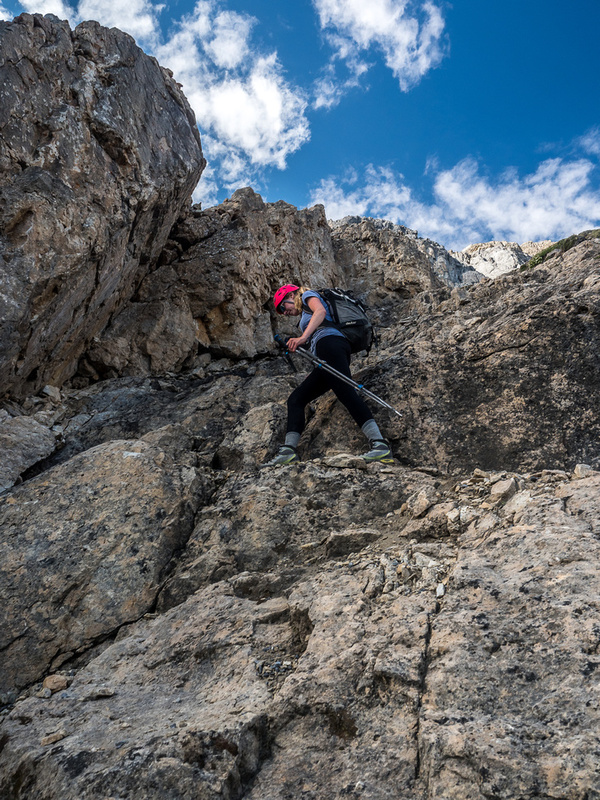 Again – the terrain was horribly loose and much care was taken to ensure we didn’t get our legs or bodies trapped in between huge, shifting rocks and boulders along the route. 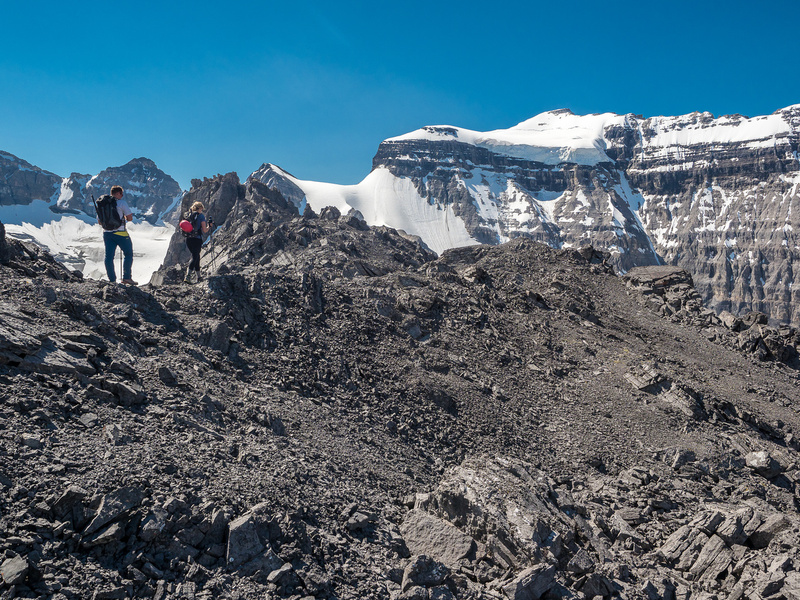 It took us over an hour to traverse from the summit to the high point – some 200m higher and 1.5km further along the ridge. 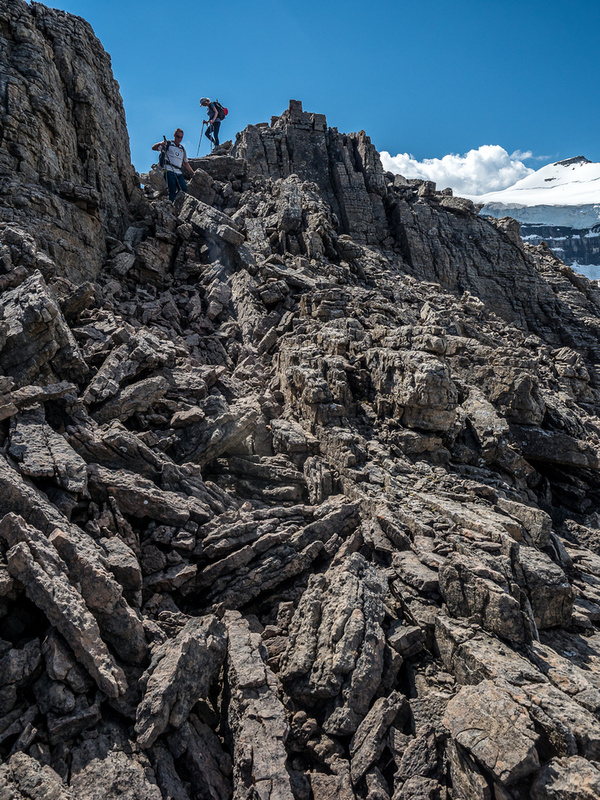 Much of the time spent was negotiating the tricky, loose ridge and broken rocks and boulders along it. And taking way too many photos of course. 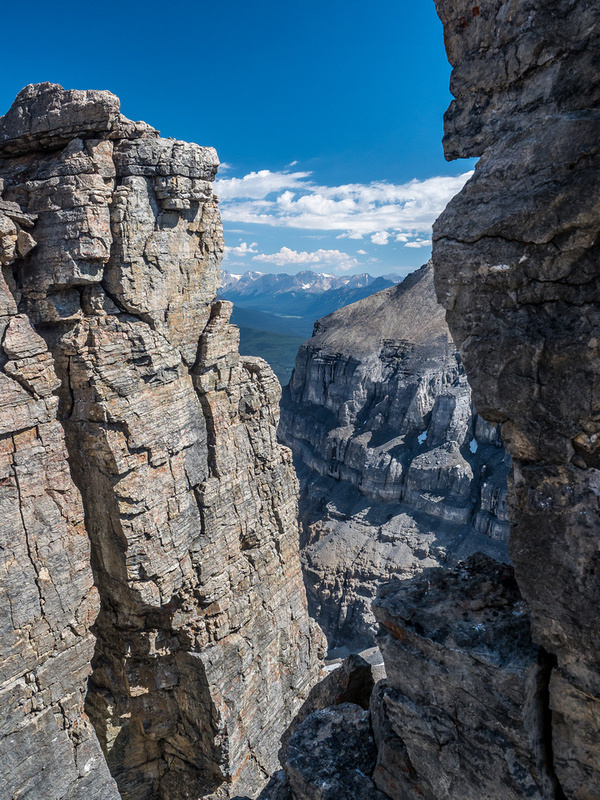 There’s no debating that the views from Divide Mountain are awesome. Bosworth at left and Niblock / Whyte at right. Exposure down to the east, Liz is having fun in the ridge maze. Great views looking east (L) and south (R) off the high point. 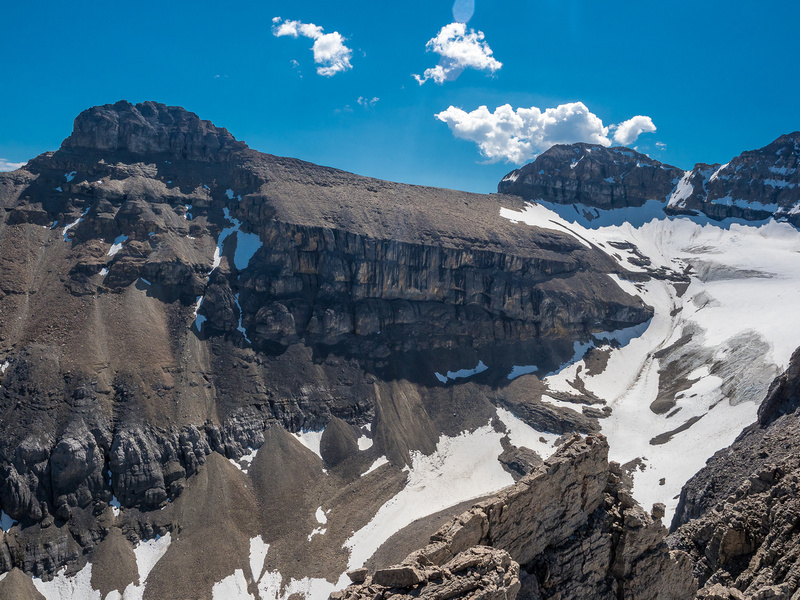 Niblock at left with Whyte at center and Pope’s Peak at right. 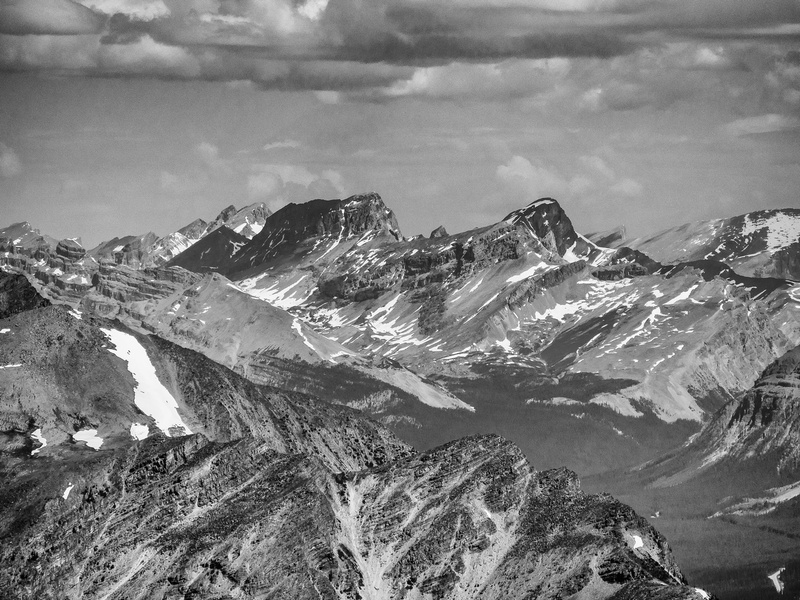 Summit views from Divide Mountain. 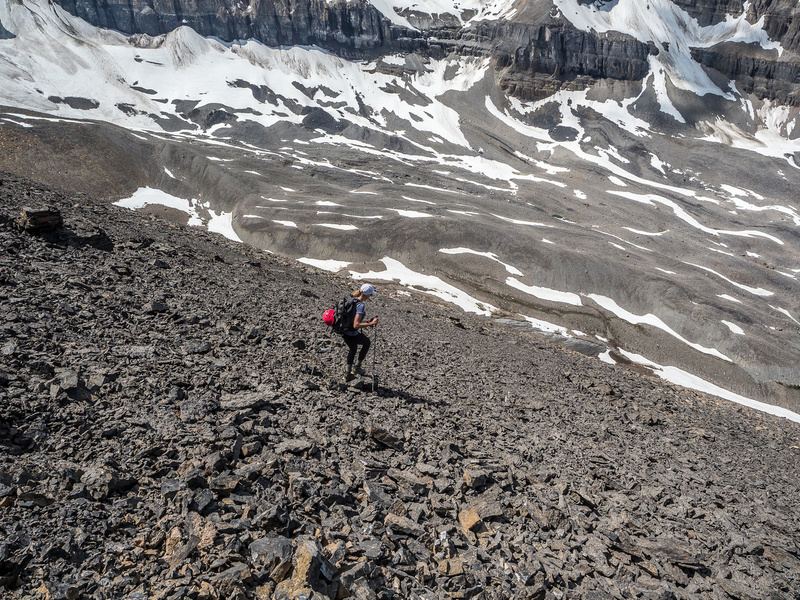 Routefinding is key to keeping the ridge at easy to moderate scrambling. 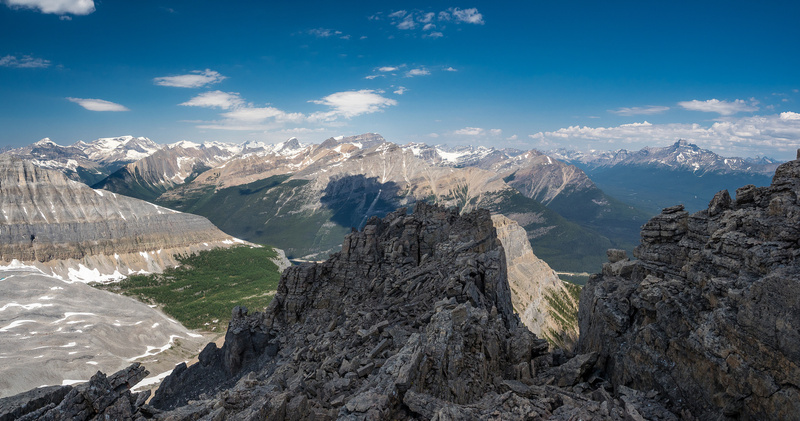 From the high point, the views were even better than from the summit. 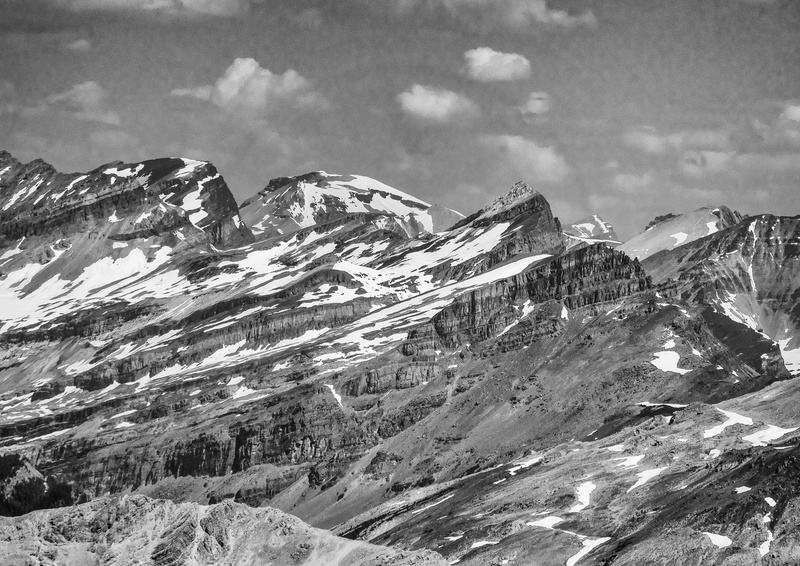 Pope’s was the most striking, but the views towards Narao and Whyte were also pretty stellar. I particularly loved the valley running down from Niblock / Whyte between Divide and out to the TCH. 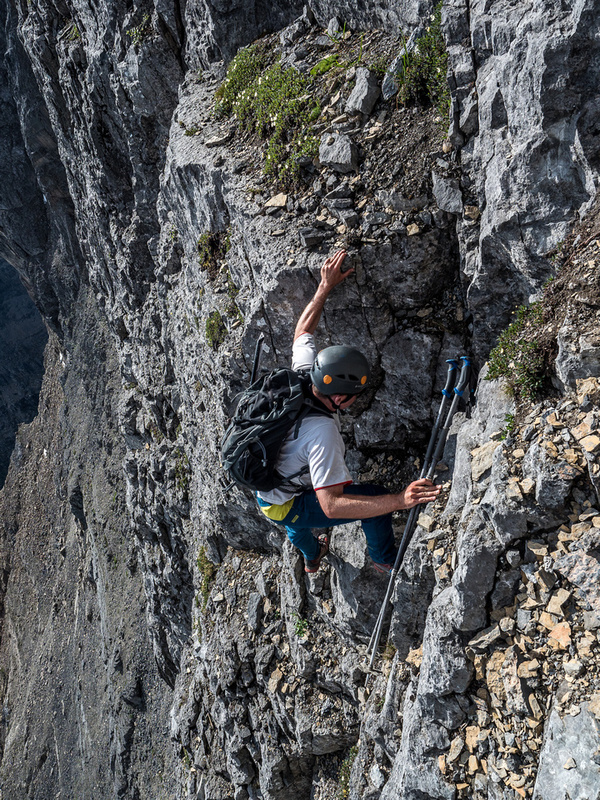 This is a very popular ski descent and I can now see why. We all agreed to make this a priority next winter. 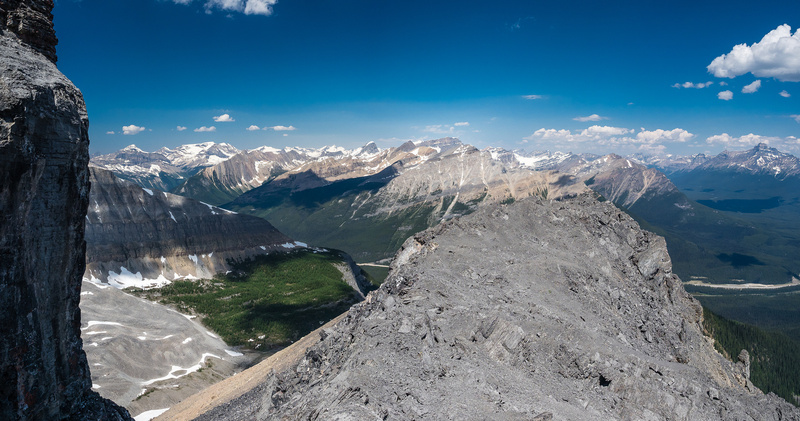 After taking another zillion photos and enjoying a nice break, we started heading down the broken ridge. Part way along the ridge, Mike suddenly asked if we’d be keen on descending into the lovely valley to the west – between Divide and Narao, as an alternate descent to Ross Lake. Both Liz and I had to think for a bit about his proposal. 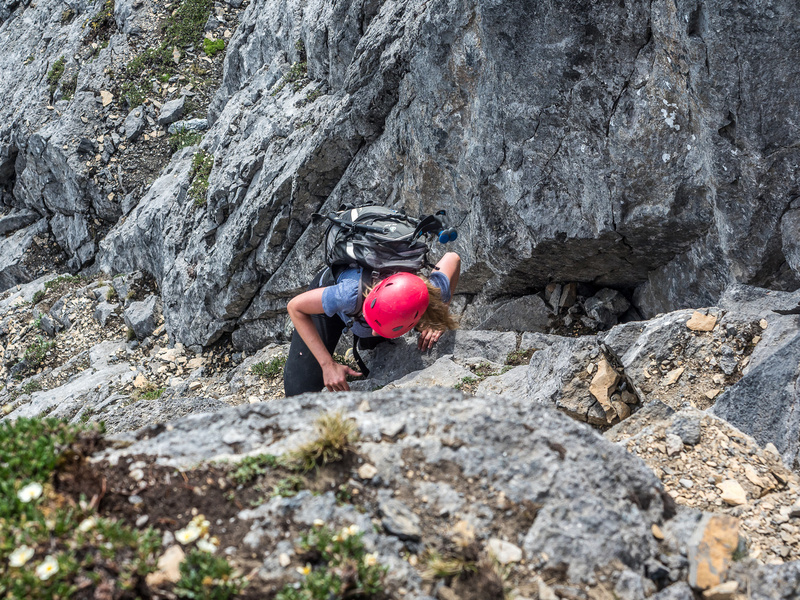 After a bit of a sufferfest descending Syncline via an alternate route, Liz had sworn off descending unknown terrain. I’ve always disliked descending terrain I haven’t come up or have very limited beta on. We had some limited beta on the valley. 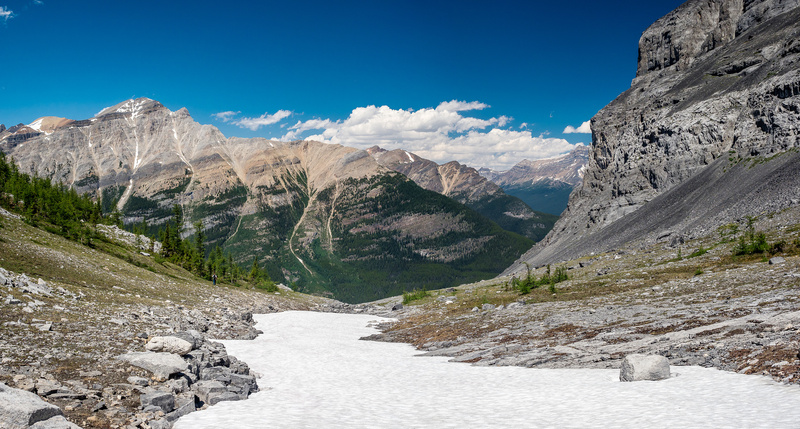 We knew that there are two steep couloirs leading to the summit of Narao from this valley – hence it is accessible by climbers / skiers from Ross Lake, somehow. 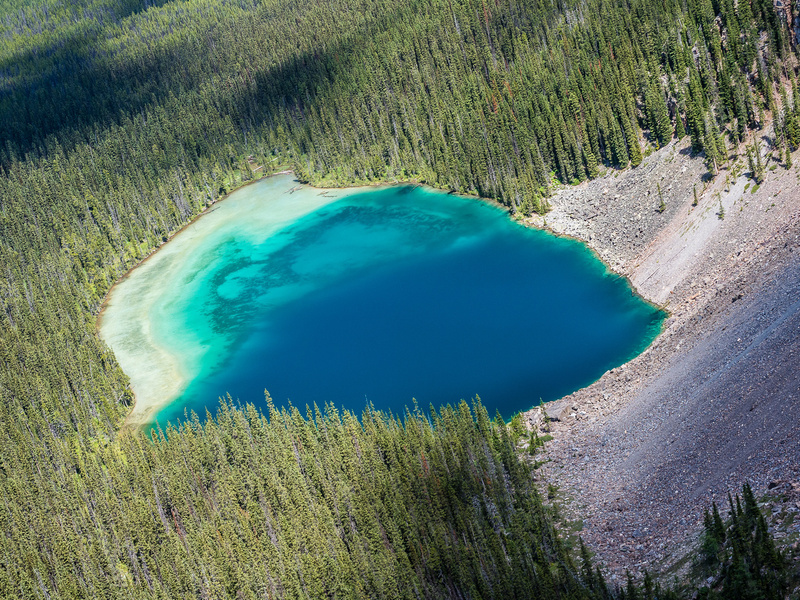 We also knew that Kane mentions an alternate descent from the lower north shoulder of Narao that accesses Ross Lake by traversing cliffs and descending steeply through treeline. Other than those two bits of beta, we knew nothing of the egress via this route. We didn’t even know for sure that we could get into the valley from Divide. Looking across at Narao’s steep walls, we would have to get a bit lucky to escape our ridge. Liz and I somewhat reluctantly agreed to Mike’s plan and we started down scree slopes to an obvious drop-off ahead, into the valley below. As we approached the drop-off, I realized that we were a bit hooped. There was a huge band of steep cliffs blocking any quick escape into the valley below. Crap. 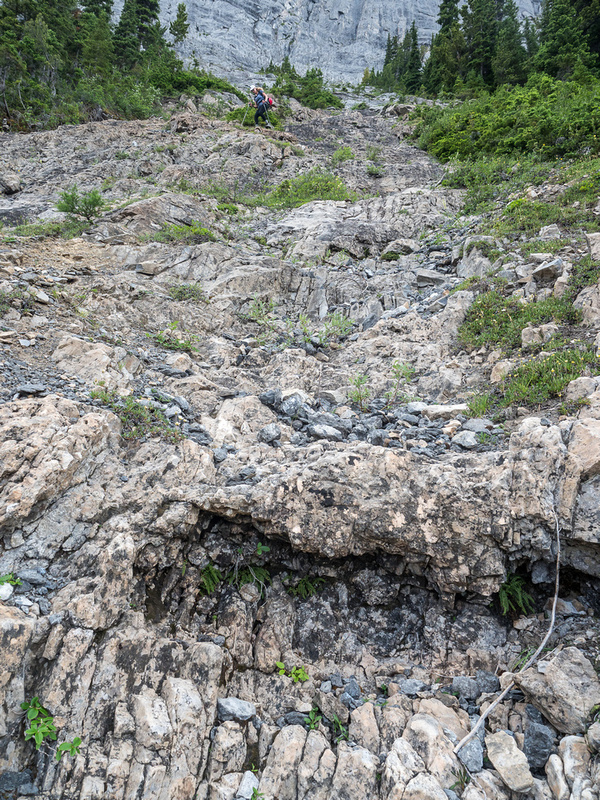 Would we have to re-ascend the long scree slope we had just descended under the hot summer sun? We followed up one risky decision with another (naturally). Mike and I both thought that the scree slope near the head of the valley led reasonably down to the valley, breaking through the cliffs. This was more of a gut feel than hard beta, but we went with it anyway. 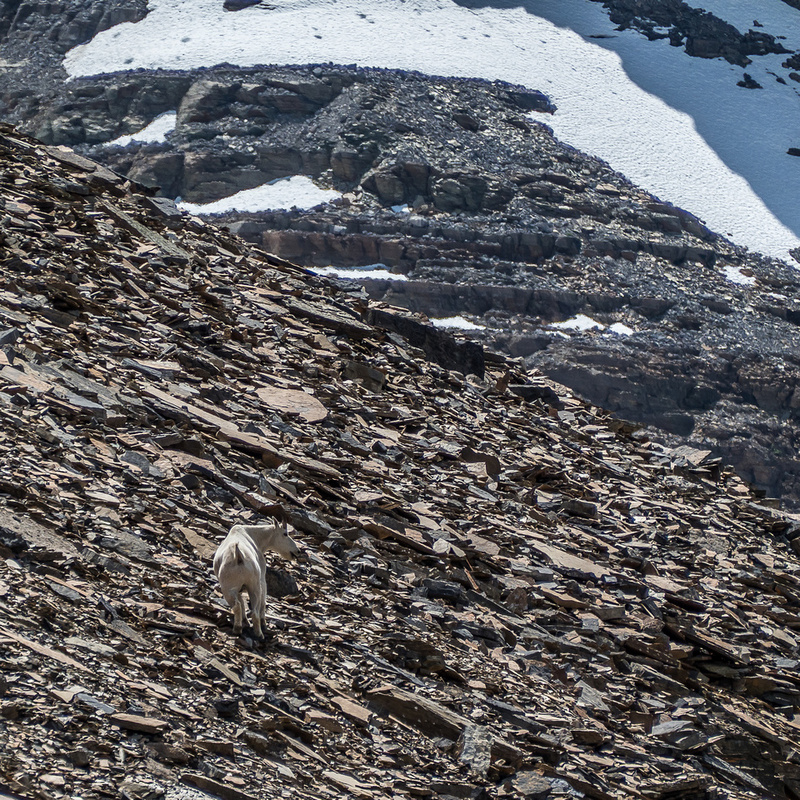 After spotting a gorgeous Mountain Goat – a good omen – we thankfully found a break, after traversing a few hundred meters back to the south on crappy scree, along the top of the cliff. The break was made even better by being in the form of firm snow. 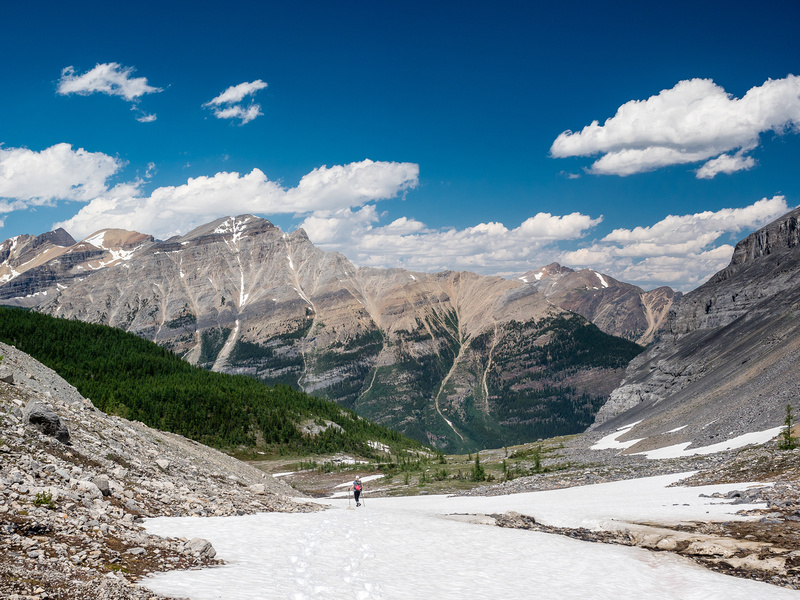 We very quickly descended into the valley bottom and continued our way along it on a mix of firm snow, karst pavement, meadows and easy scree. Looking above to Divide Mountain, it was very obvious that we got lucky with a break through the towering cliffs guarding almost its entire west aspect. But we weren’t home-free just yet. Descending to Ross Lake – Divide Peak rising at right. Ross Lake with Divide Mountain looming over it. Somewhat nervously, we approached the head of the hanging valley we were in. I was suitably impressed by the two steep snow couloirs leading to the summit Narao from this beautiful, valley. 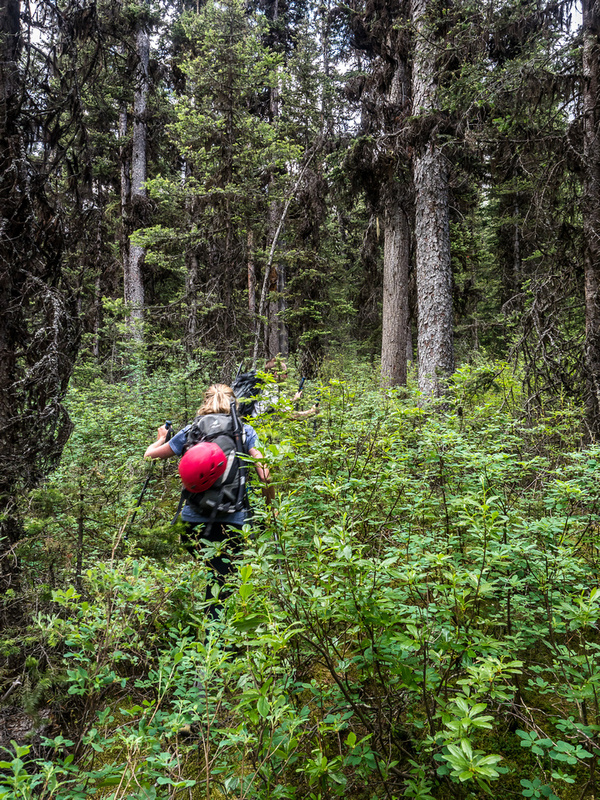 Near the northern end, we realized that there were a number of larches in the small forest coming off Narao’s ridge – this must be extra lovely in the fall. 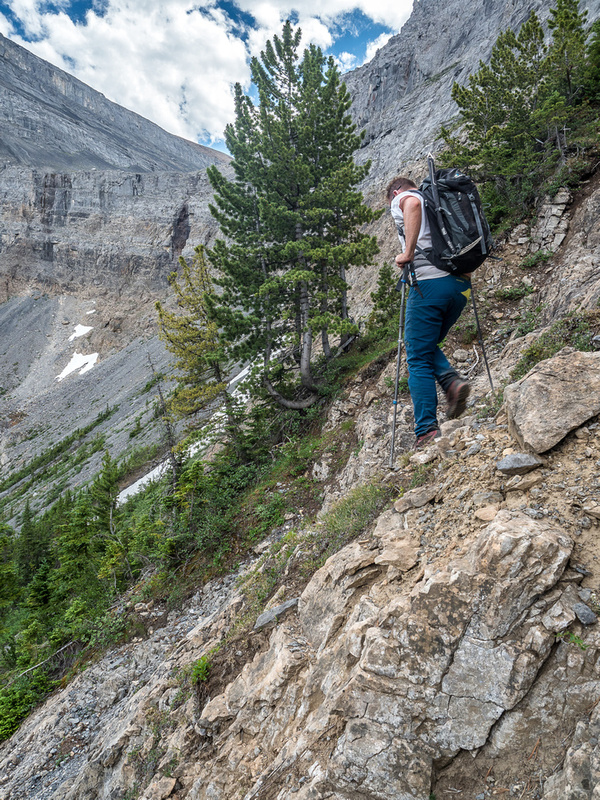 The terrain steepened considerably as we progressed until we were clearly standing on top of yet another cliff – this time guarding a quick exit to Ross Lake, several hundred vertical meters below. Thankfully there was an obvious escape from our latest predicament to our left. A scree bench, complete with partial trail, led alongside the cliffs, breaking through to an obvious, steep descent to treeline and Ross Lake below. Phew. We were almost home-free! 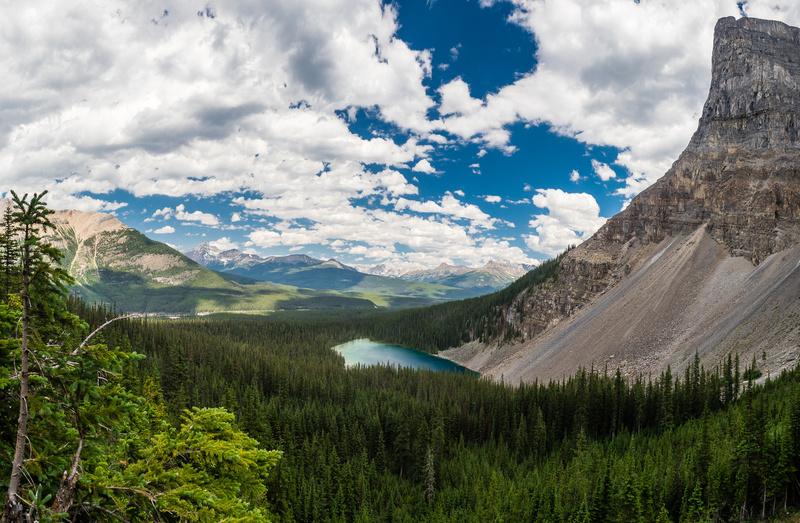 (After coming back from our trip, I read several trip reports detailing the route from the hanging valley to Ross Lake. Somehow I never registered these.) 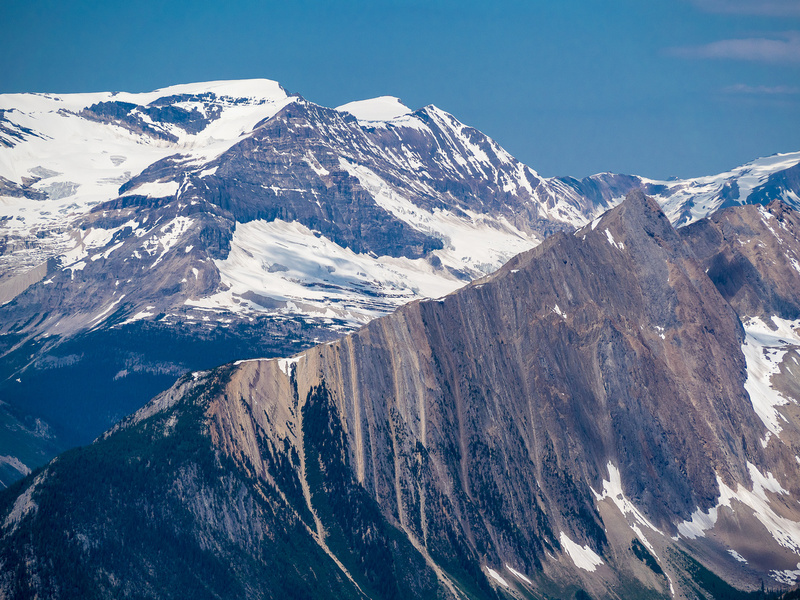 We enjoyed the great view of Divide’s steep north aspect looming over the gem-of-a-lake below, before starting the descent to Ross Lake. 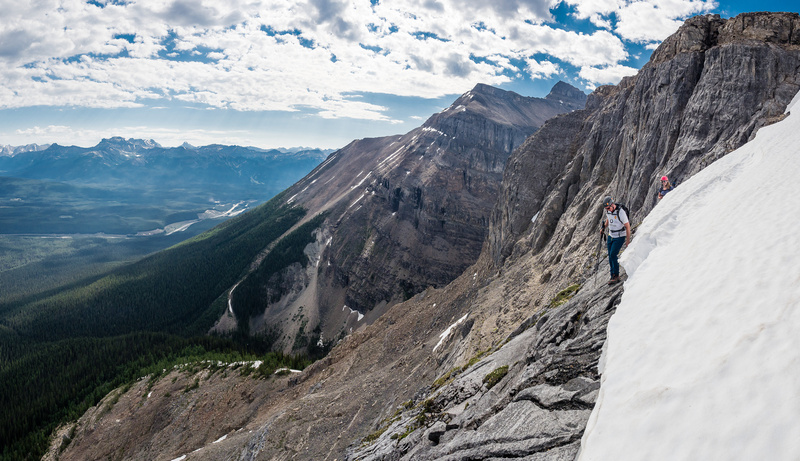 The ledge was wide enough to present as an easy hike until we found ourselves looking down a very steep exit slope. 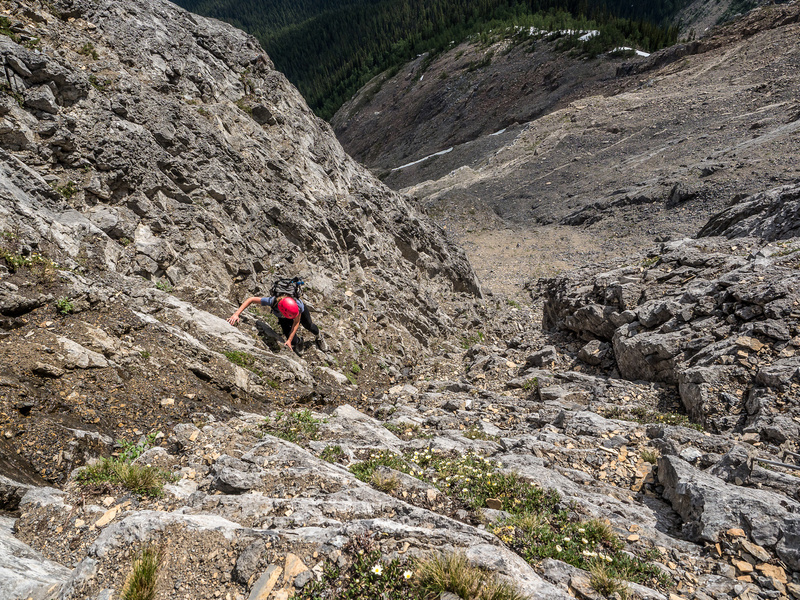 This slope shouldn’t be underestimated – it’s not a simple hike but at least moderate scrambling in sections. 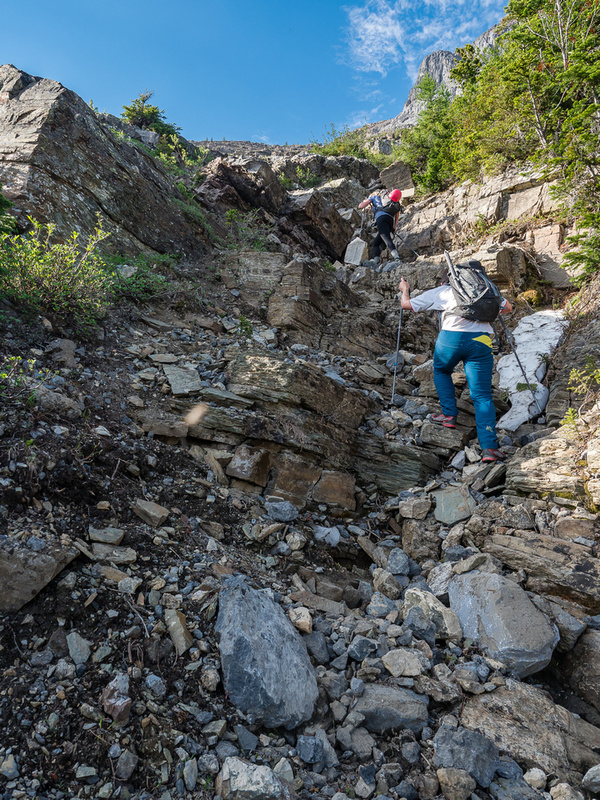 We scrambled and groveled down easy to moderate terrain which included steep dirt, scree and slabs until finally exiting into a rocky stream bed which we followed into the forest guarding Ross Lake. A short (hot!) bushwhack found us on a faint trail leading towards the approach to Ross Lake. We followed the trail easily before it intersected with our morning approach. 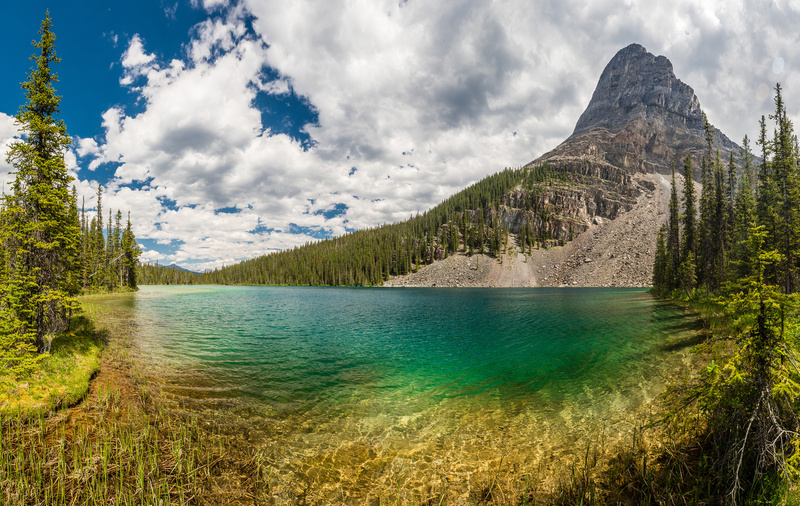 Ross Lake was a very deep green color – the backdrop of Divide Mountain was stunning and sheer, rising above it. The trail back towards the decommissioned highway was quick and the mosquitoes were much calmer in the brutal heat than they’d been that morning. From the outlet of Ross Lake the intimidating Divide Mountain looms over us. 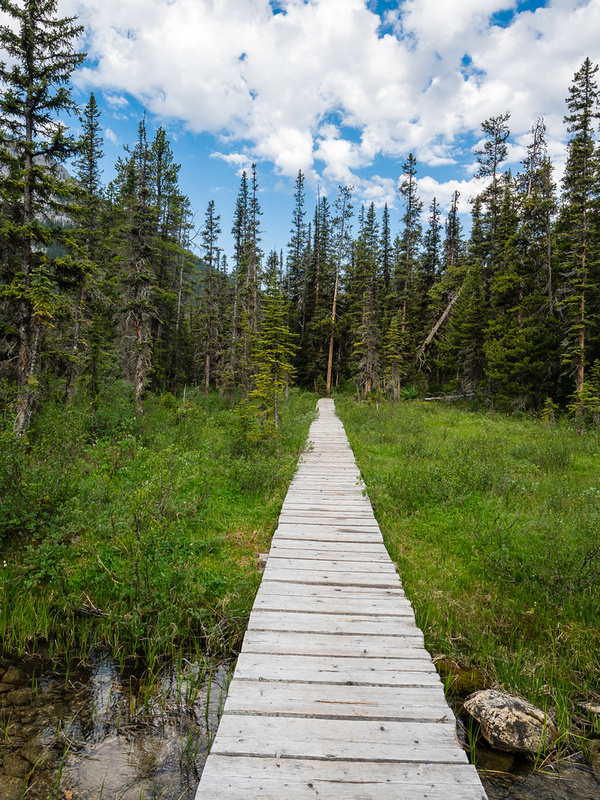 The boardwalk at Ross Lake. The bushwhack is mercifully short and relatively easy despite appearances. Thankfully Mike agreed to eat the spider webs on ascent. Mike on the lower NE shoulder with Hector in the distant background and the avy slope at lower left. A view of the north face with our route still looking rather fierce. Liz on easy scrambling terrain up the shoulder. We ascended the shallow, slabby feature just above Liz's head to the left. The shallow gully feature that leads up to the base of the crux chimney. Mike stands under the crux, ready to start up. Liz tried on climber's right, but there was an easier route on climber's left which is were I am and where she's coming over to. [Looking down as Liz crosses to the easier climber's left access to the base of the crux. Mike comes up the crux. 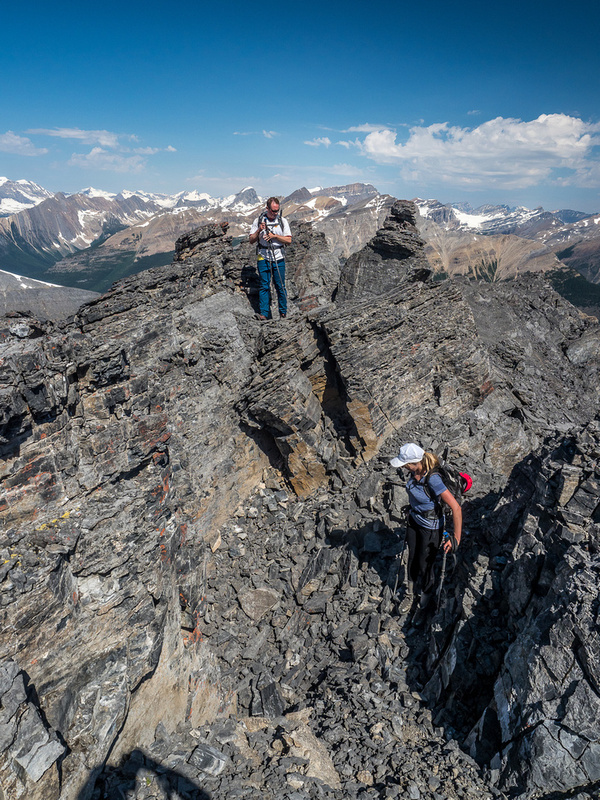 [A great shot of Mike and Liz in the crux chimney on Divide. Looking down the crux - chimney on right and ledges on left. This may not look like much but it was our second crux - a slip to the left would be fatal and the rock was wet from the melting snow. 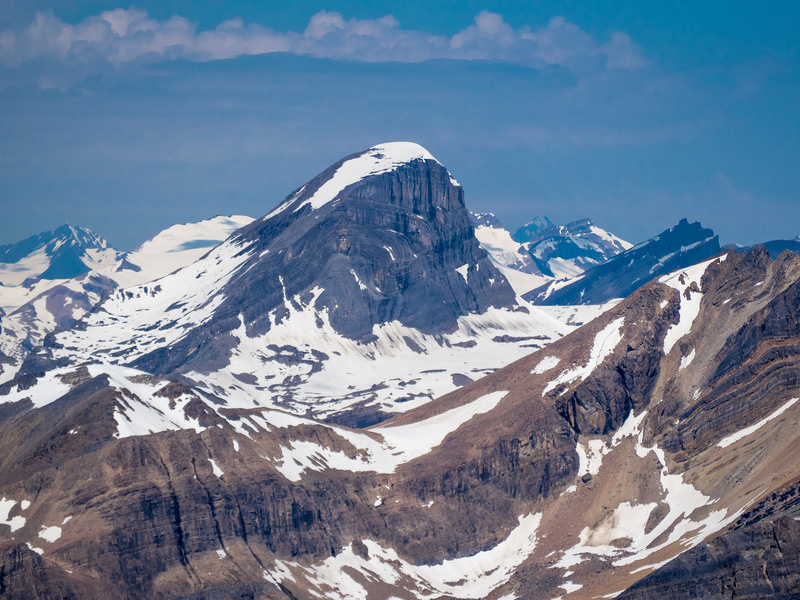 There's no debating that the views from Divide Mountain are awesome. Bosworth at left and Niblock / Whyte at right. 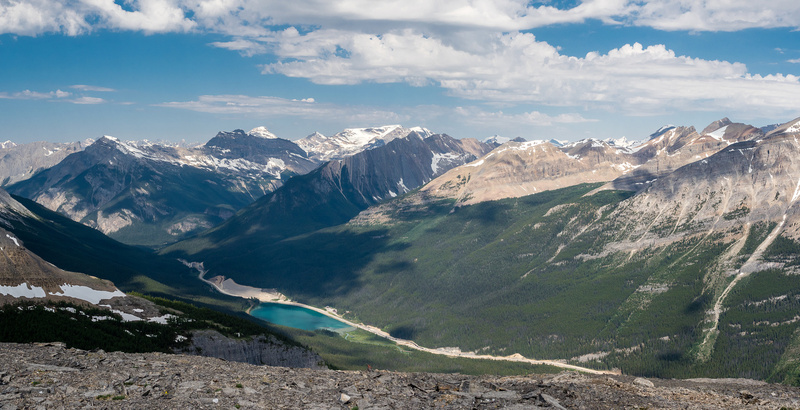 Looking over Wapta Lake towards Field, Wapta, Carnarvon, Ogden and many other Yoho peaks. Mike starts the interesting scramble along the ridge to the high point which looks deceptively easy and close from here. Looking back over Divide Mountain from part way along the ridge. Narao at left. The terrain starts to get interesting again - Pope's rising dramatically in the distance at right. Lots of very loose rock and interesting little notches along the ridge. 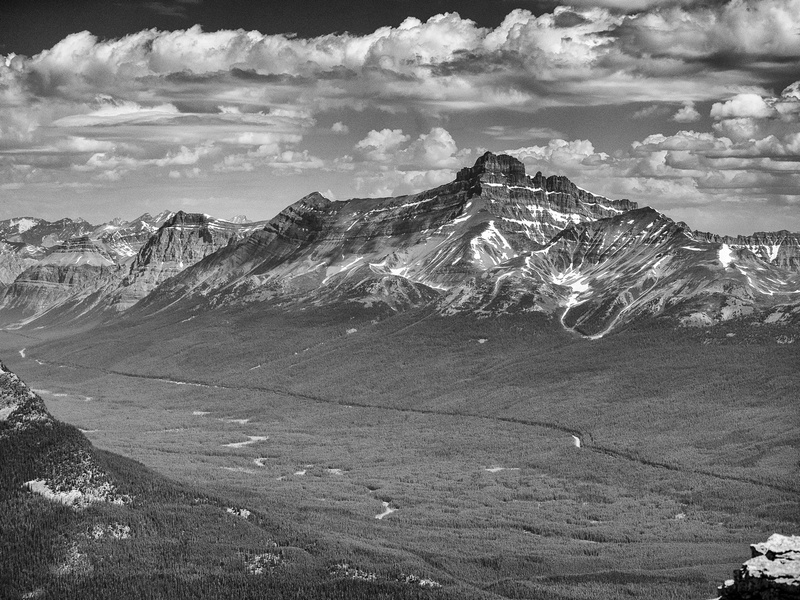 Niblock at left with Whyte at center and Pope's Peak at right. Niblock (L) and Whyte (R) with the upper part of the ski tour in the foreground looking awesome. 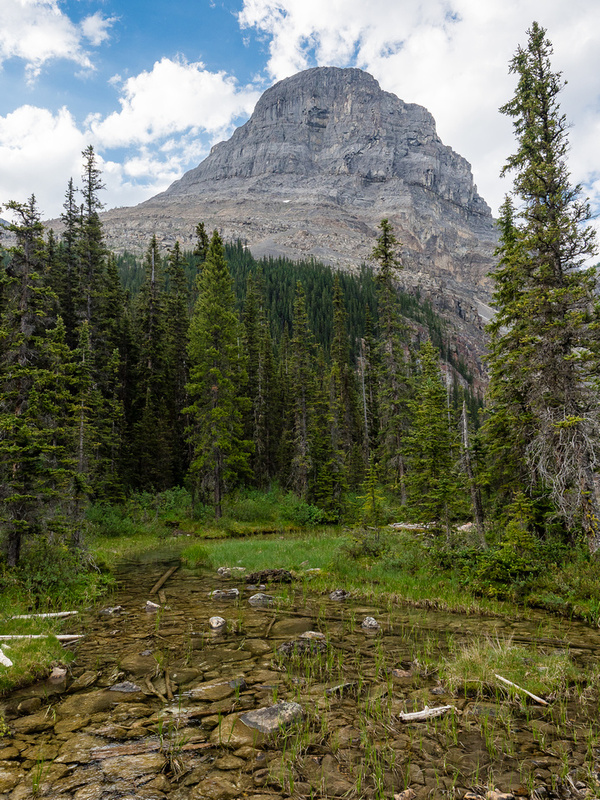 Molar Mountain and Tower with Cataract rising beyond. Little and Big Hector with Hector South at right. OXO with Watermelon Peak beyond. 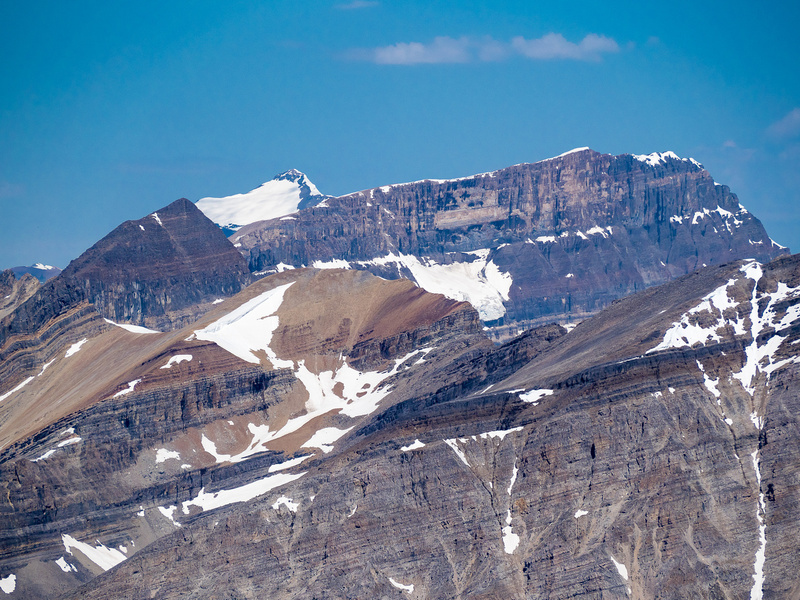 Mount Carnarvon looms over Wapta Mountain. Des Poilus at distant left and Mount Niles at right. Balfour rising over the ridge of Mount Daly. 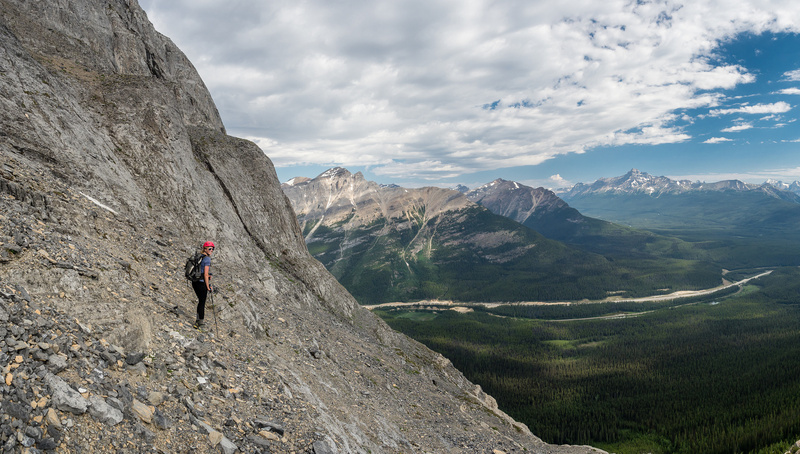 Descending the ridge with gorgeous views. More of the broken ridge on descent - there's a reason it took us an hour to get up it! 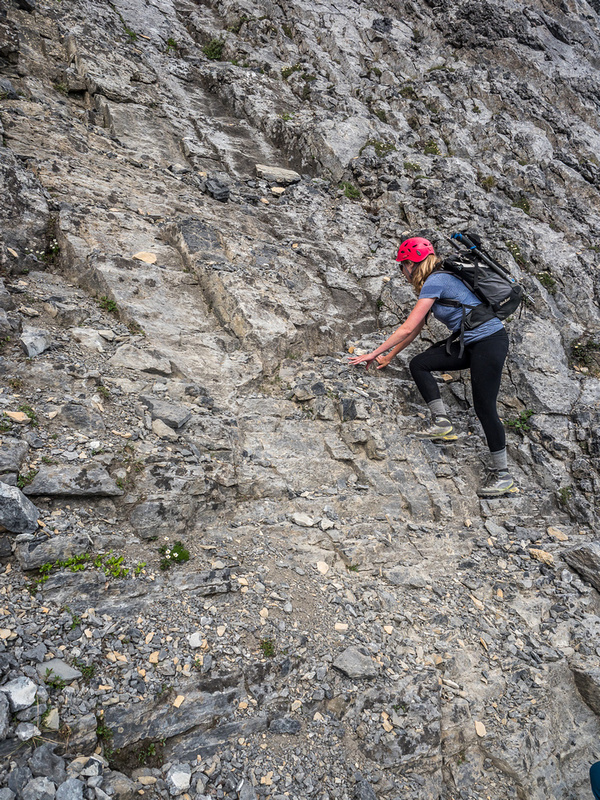 Liz downclimbs an upper moderate step on the ridge. Liz isn't convinced that it'll go, but so far the scree slope leading down to the exit valley looks promising. 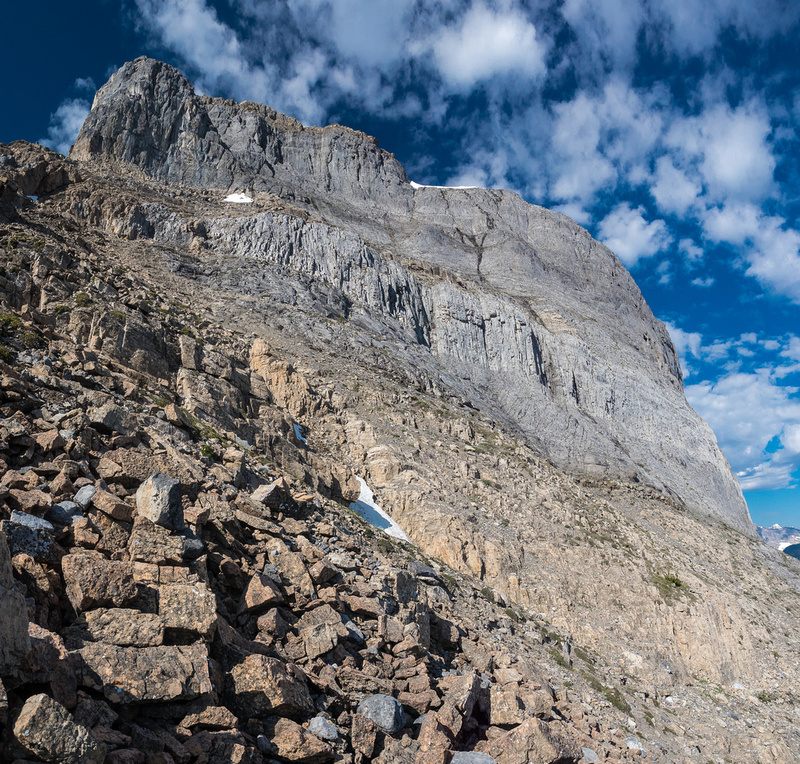 Looking back along our scree traverse, it's obvious why we couldn't descend straight down to the valley. Escape route! 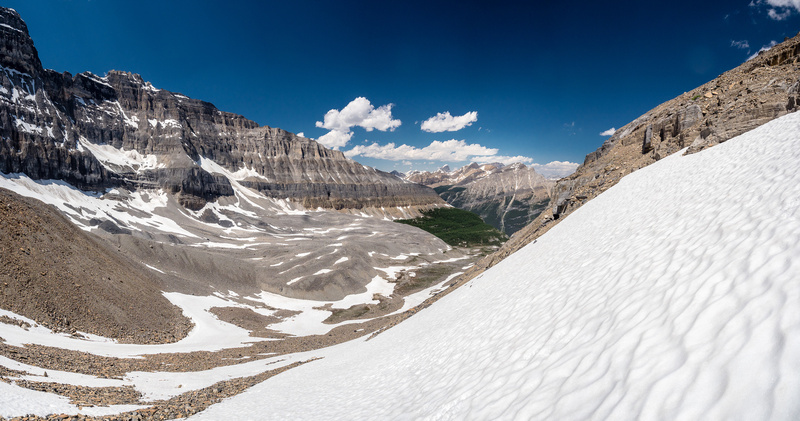 The snow slope that assisted our escape past the cliff wall guarding the west aspect of Divide Mountain. Looking back at Divide's west aspect as Mike and Liz follow me down. A good view down-valley showing the cliffs from Divide at right and Narao at left. Gorgeous views north out of the end of the hanging valley towards Bosworth. Mike is tiny next to Divide's cliffs at right as he approaches the end of the valley. 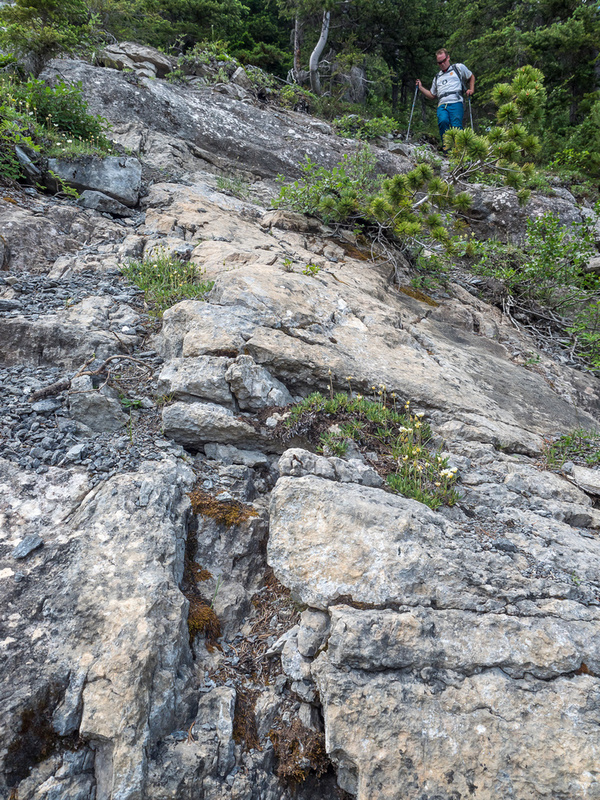 Despite cliffs guarding easy or direct access from Ross Lake, there is an escape route visible at left in the form of a scree bench leading to steep, treed slopes. Ross Lake and Divide Mountain. 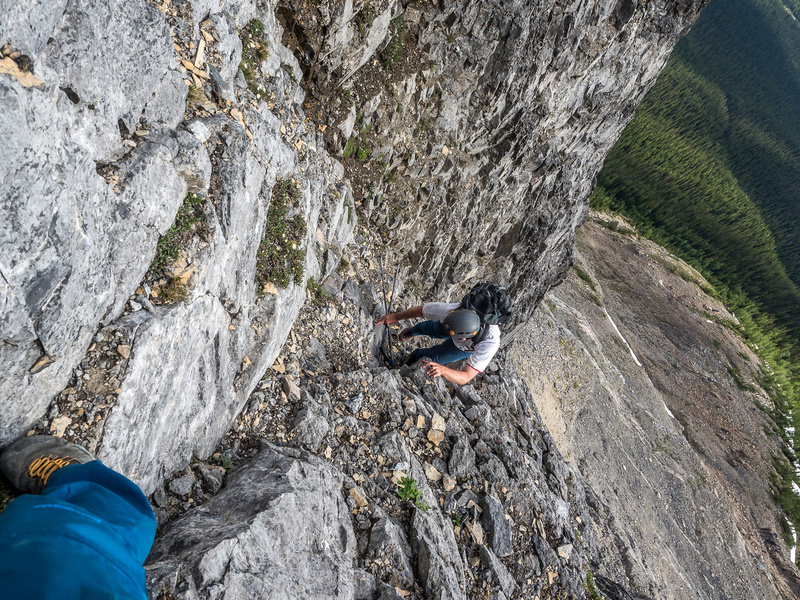 Moderate scrambling down slabs - littered with pebbles and dirt of course. 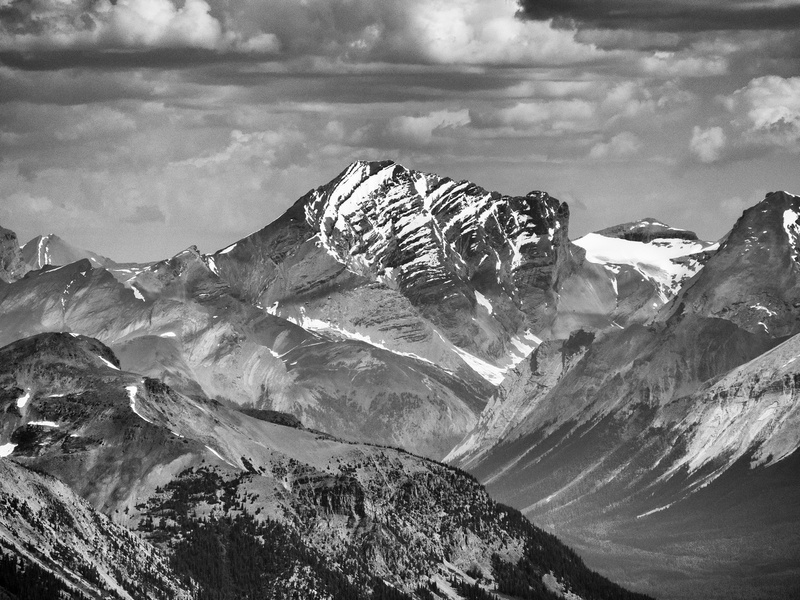 Divide Mountain certainly looks impressive from this angle. We arrived at the cars around 8 hours after leaving them. 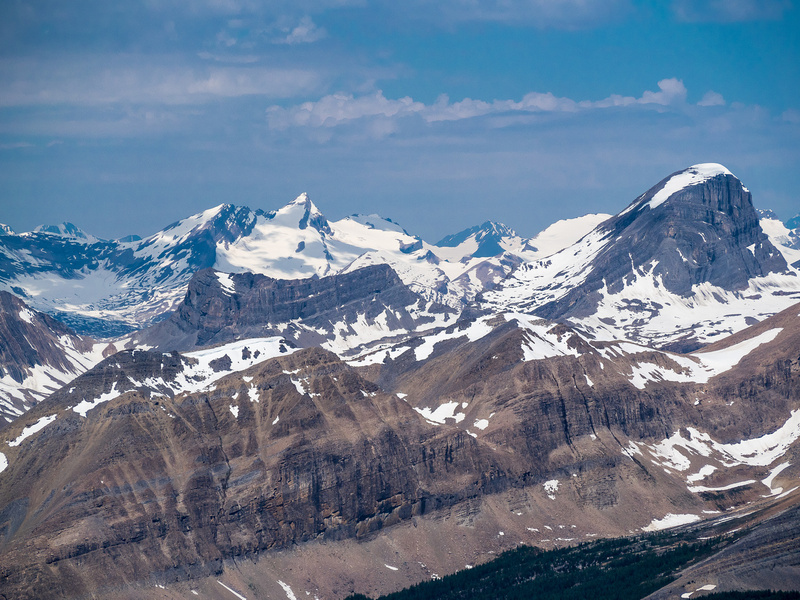 I highly recommend Divide Mountain for experienced scramblers who have tested themselves already on some of the easier Kane difficult peaks, such as Galatea, Warspite, The Fist or something similar. 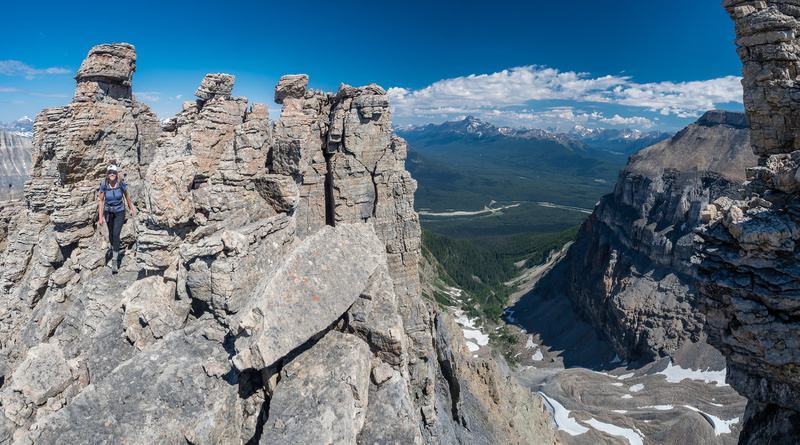 The crux, while short, is pretty exposed and the terrain is very loose all around it. If you have a sense of adventure I would also highly recommend continuing the interesting ridge ‘maze’ to the highest point and exiting via the hanging valley like we did. Now you know that there is a great route out of this valley that presents some gorgeous scenery and interesting terrain.